The Book of Proverbs has one central message (how to gain wisdom) and deals with an extensive array of practical topics including vocation, financial stewardship, moral purity, and how to have successful relationships. Here, Jim Newheiser guides the reader through all the main aspects of the teaching of Proverbs while also emphasizing how these great, life-transforming truths are rooted in the gospel of Jesus Christ. 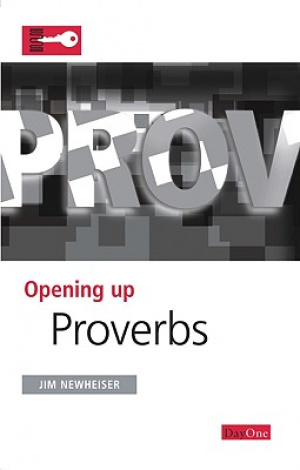 Opening Up Proverbs by Jim Newheiser was published by Day One in August 2015 and is our 8230th best seller. The ISBN for Opening Up Proverbs is 9781846251108. Be the first to review Opening Up Proverbs! Got a question? No problem! Just click here to ask us about Opening Up Proverbs. Jim Newheiser: MA, DMin, Westminster Theological Seminary. Jim has been practicing biblical counseling for over 20 years is a NANC Fellow and has served as the director of IBCD since 2006. He has been a pastor at Grace Bible Church in Escondido, CA since 1990. Many of GBC’s former interns are serving as missionaries, seminary professors and pastors. Jim is a founding member and Executive Board member of the Fellowship of Independent Reformed Evangelicals. He is an international retreat and conference speaker. Jim is author of “Opening Up Proverbs” and co-author of “When Good Kids Make Bad Choices” and “You Never Stop Being a Parent”.